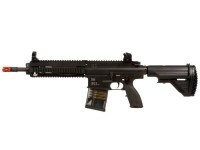 The H&K 417 AEG airsoft rifle is Umarex's latest addition to their line of high performing AEGs. 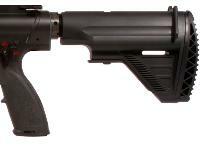 This sleek rifle is licensed by Heckler & Koch and features the Iconic H&K logo on the receiver and color-filled fire selector switch. The rifle is full metal with the exception of the stock and grip, this lends a realistic feel to the weight of the gun when fired. 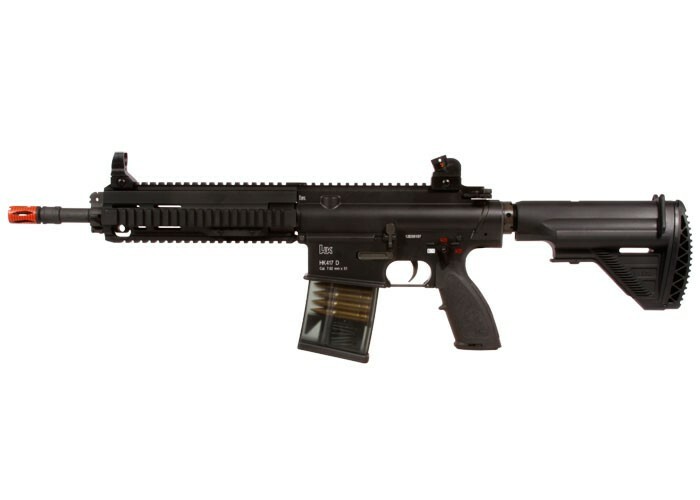 The H&K 417 AEG features an adjustable stock that can accommodate users of any body type, a high-capacity 100 rd magazine and a shot velocity of 420-450 fps (using .20g BBs). 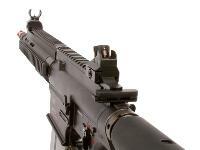 Mount a rifle scope on the monolithic Weaver/Picatinny rail. 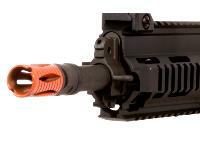 The quad Weaver/Picatinny foregrip rail lets you add red dots and flashlights for added versatility. The shot trajectory on faraway battlefield targets can also be dialed in using the adjustable hop-up unit. 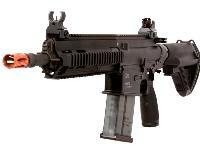 This AEG is highly recommended for experienced airsoft enthusiasts. 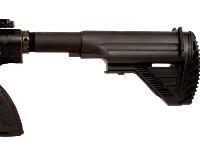 Things I would have changed: The gearbox or whatever it is inside the gun where u Change the rate after fire. This gun has a bad manufacturer flaw. Things I liked: Fully functioning bolt catch, the stiff and rigid frame,the access to the battery compartment is also very easy, the high fps and mock shells in the mid caps. Things I would have changed: No! 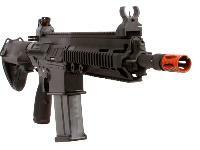 What others should know: High Quality top of the line AEG for right outa the box use no upgrades needed but easier to upgrade than most. Review very helpful. Thanks for taking the time. Things I liked: CNC aluminum construction, high fps., accurate,this thing is a beast. 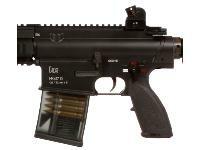 The internals make this gun. 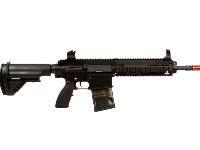 What others should know: This gun is made for outa the box use for seasoned airsoft players. No upgrades required.